We haven’t told you any fresh information about the next instalment in Call of Duty series for a long time, but today we are ready to share lots of exciting and interesting CoD: Advanced Warfare news. It seems that recently it has become very popular to announce some new information about the upcoming projects through the Twitter accounts of the developers or game designers. And the Call of Duty: Advanced Warfare’s creators aren’t an exception. 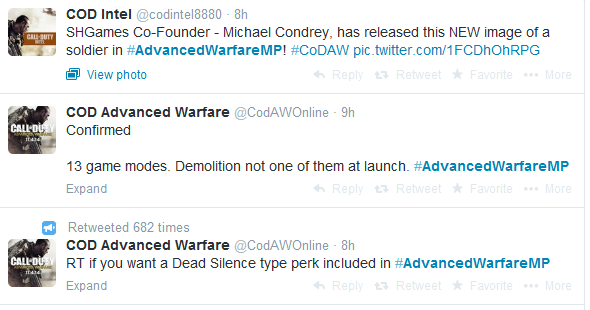 During the past few days, the co-founder of Sledgehammer Games studio - Michael Condrey - has told many interesting and intriguing CoD: Advanced Warfare news. Thus, we have got to know that the Wii U version of the game isn’t planned at all, because Activision has decided to focus on the development of the game’s next-gen consoles and PC versions. Also, Michael Condrey, answering on the fan’s question, has told that the forthcoming shooter will get the splitscreen, but at the same time he hasn’t specified the number of supported gamers. 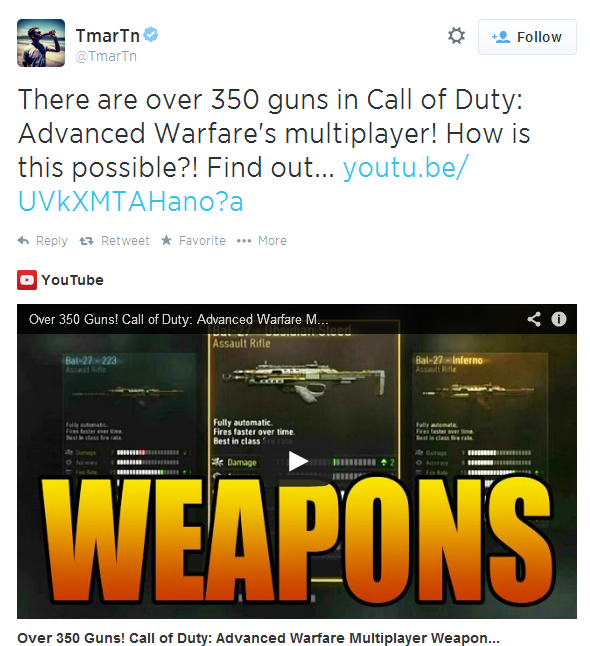 Besides it, he has written that the game’s multiplayer will include 350 types of guns and more than 25 weapon attachements. 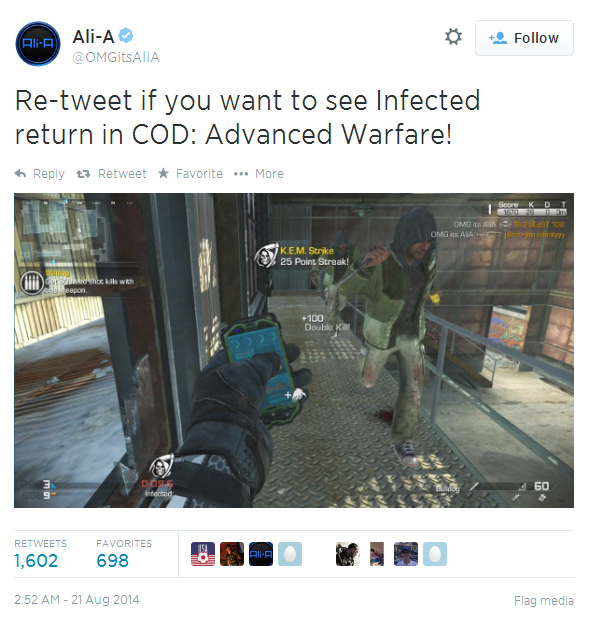 And on the game’s page in this social network there is another tweet, which tells that Call of Duty: Advanced Warfare will let you play in 13 modes, but Demolition isn’t one of them. And the last intriguing message concerns the Infected mode. Would you like it to come back? If your answer is positive, then retweet this Michael’s post and wait for the feedback. As for us, we are almost sure that this is another tricky developers’ advertising tool, and actually this mode is already included in those 13 ones, about which we’ve told you above. 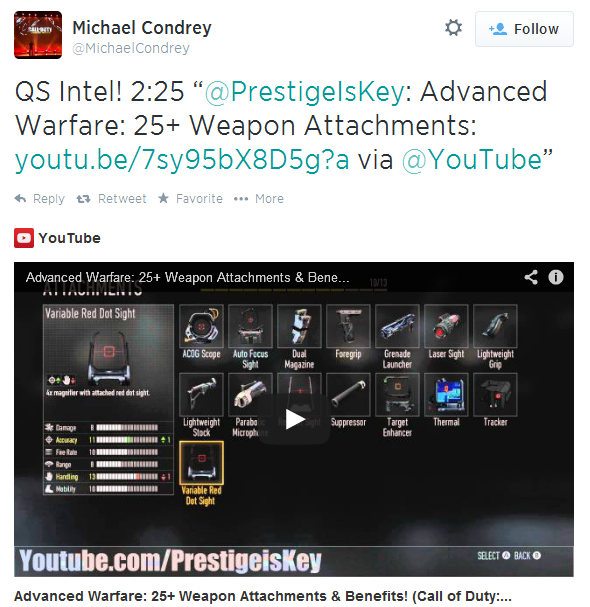 Are you satisfied with these fresh CoD: Advanced Warfare news? Are you waiting for the game’s release? Don’t be shy and write us at the bottom of the page.